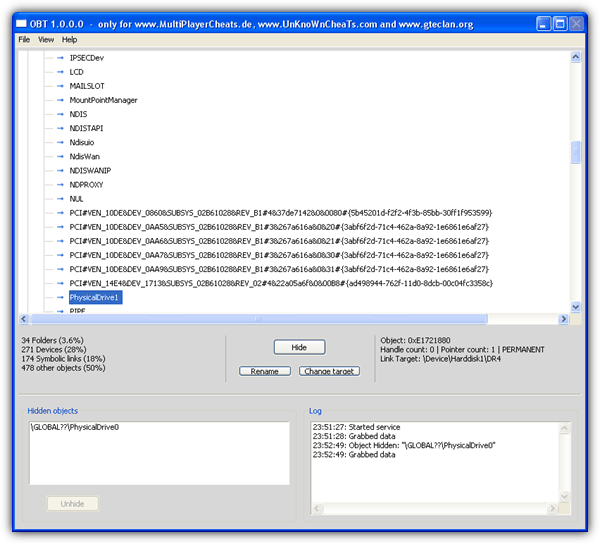 HWSpoofer was tested and is only compatible with Windows 2000/XP but works along the same lines as PB DownForce in spoofing the hard disk’s serial number. The program has no interface and you simply execute it to patch the system, an ini file will be created in the same folder with the spoofing details. If you want to change the spoofed serial number, simply delete the ini file to generate another set of numbers. To run HWSpoofer again you will need to reboot the the system as blue screens or crashes are likely to follow if you try to run it again. Like PB Downforce, HWSpoofer will also try to spoof your network adapters MAC address. This tool does something a little bit different and actually hides your drives and optionally network adapters completely instead of trying to spoof the serial number. Open the program and Expand [ROOT] -> GLOBAL? 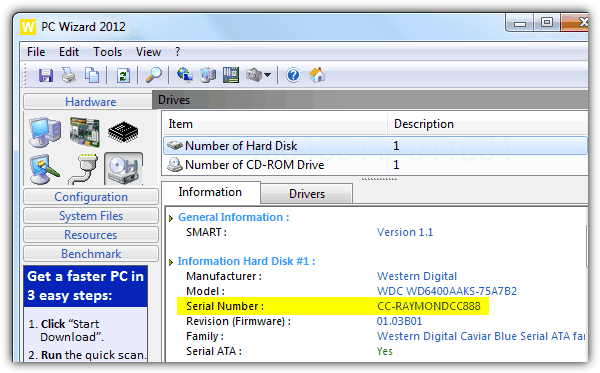 ?, select PhysicalDrive0 and then click Hide. Alternatively, you can click on the File menu -> “Hide all PB related symbolic links”. To get the drives back again, select Unhide all entries from the File menu. As most of the tools mentioned above are not really made for newer Windows operating systems, Chameleon is probably the only hardware ID spoofing tool that can run on Windows 7 and Windows 8. Chameleon runs in kernel mode (Ring 0) to change the hard-coded serial number on hard drives and also the MAC address on network adapters. Currently it is limited to 32-bit version of Windows but 64-bit support will be released later this year. The process of getting Chameleon to run can be a bit long. After purchase, you need to create a forum account and upgrade it to VIP from the provided web control panel. Then download the software, extract and run the Loader as administrator which will automatically generate a hardware information text file. Go back to the control panel, go to Update HardwareID and enter all 5 information from the hardware information text file. You will instantly receive a license.dat file to be placed at the same folder as the Loader file. 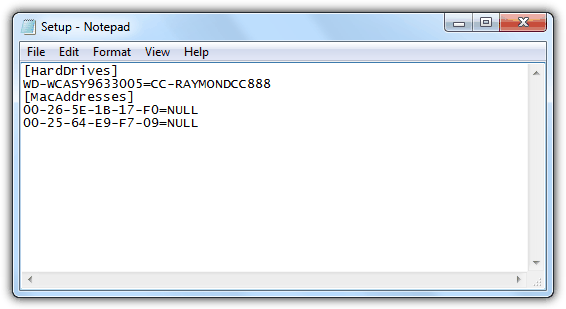 Now you’ll need to rename the Loader.exe to any other file name, such as raymond.exe and then run it as admin. A Setup.ini file will be generated and saved in the program’s folder. Open Setup.ini file with a text editor such as Notepad, and change the NULL to any spoofed serial number that you want with the exact same length as the originals. Save the changes made in Setup.ini and run the software again. You will need to wait for a while until you see a window telling you that “Chameleon has been loaded successfully”, which means that your hard drive serial number has been successfully changed. ORGANNER, the company that develops Chameleon promises that the upcoming version 2 will be easier to manage from the web panel. Chameleon cost €69.95 for a lifetime license with 2 hardware ID changes. Special Note: Do be aware that because of the nature of these tools they hook Windows functions at a very low level (ring0) and do behave rather like rootkits in the eyes of security software. Your Antivirus program will definitely complain that PB Downforce and HWSpoofer are trojans so you will have to either allow them in your Antivirus or turn it off temporarily while using these tools.